Four authentic past papers from Cambridge ESOL for the Cambridge English: Preliminary exam, also known as Preliminary English Test (PET). 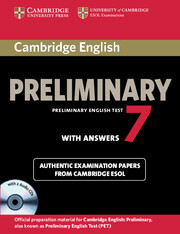 Cambridge English: Preliminary is at CEF level B1. The Student's Book Pack contains everything needed to allow candidates to familiarise themselves with the content and format of the exam. 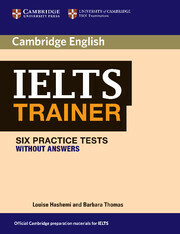 The Student's Book with Answers contains practice material for Paper 1 (Reading and Writing) and Paper 2 (Listening), along with attractive colour visual material to enable thorough preparation for Paper 3 (Speaking). The accompanying Audio CDs contain material for the listening paper.